You asked, we built it! We recently added new filters to our receipt tables so you can see which receipts have (and have not) been exported to different programs and report formats. 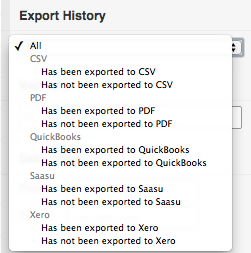 If you use any of our awesome integrations like QuickBooks or Xero, you can quickly use the new filters to show (or exclude) receipts that have already been exported to those programs. The filters also work for our PDF and CSV exports so your expense reports are sure to include every reimbursable receipt! If you have any feedback on the new filters, reach us 24/7 at help@team.shoeboxed.com or @ShoeboxedHelp. Shoeboxed New Headquarters and Change of Address!